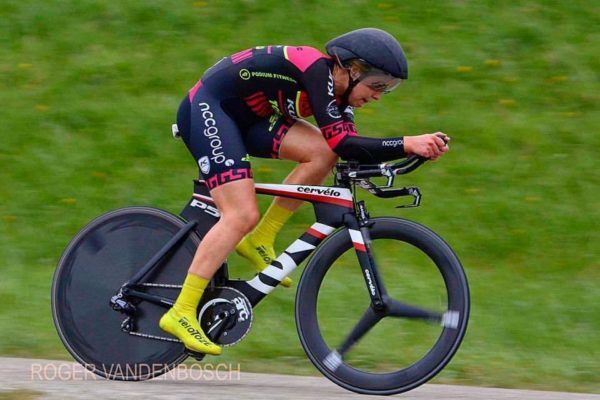 Eileen Burns has stormed to one of fastest ever 25 mile TT times by an Irish woman over the weekend. The Ballymena Road Club rider’s 52:47 is the first time she has broken the 53 minute mark. Only the current Irish 25 mile record holder Anna Turvey has gone faster. She did a 51:24 last July to break the Irish record previously held by Burns. Burns set her new time, some 20 seconds faster than her previous best set last April, in south Wales on Sunday. Riding the event on the R25-3H course at Aberdare she finished 2nd in the combined women’s, junior and Masters event. It was won by Katie Allan of Draz2Zero in a time of 51:55. Allen’s average speed was 28.89 miles per hour. Burns clocked 28.41 miles per hour. The performance of the Irish rider is all the more remarkable as she was hit by a van out training on May 5th. She suffered ligament damage and has been strapped up ever since. Her grandfather also died at the weekend and she has dedicated her result to him. We’ll have a long overdue interview with Burns in coming days.